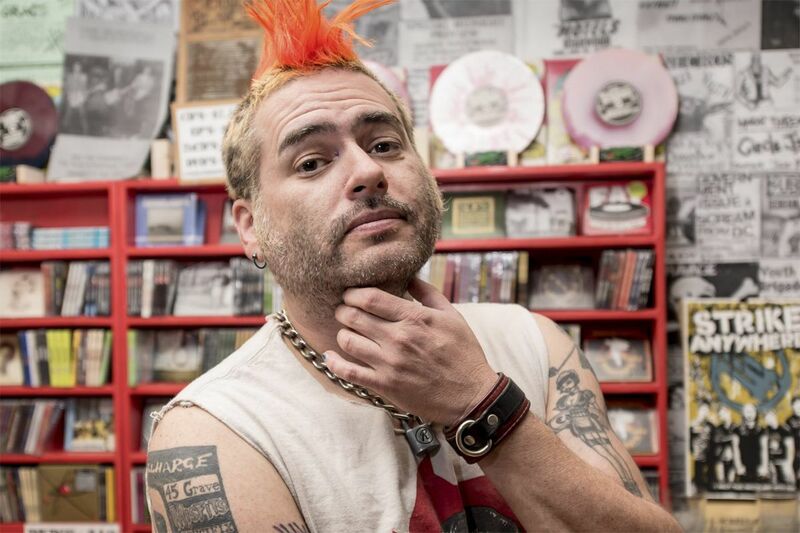 “Fat” Mike Burkett of legendary punk band NOFX comes to Philly on Sunday, May 13 as part of the Punk in Drublic beer and music festival. In frontman "Fat" Mike Burkett's estimation, his long-standing punk-rock band NOFX hasn't played Philadelphia proper in about 30 years, even though they have played here several times in the past, most recently in April 2016 at the Theatre of Living Arts. But this weekend, they're coming back to town. And they're bringing beer. Burkett, 51, is heading to Festival Pier with NOFX on Sunday as part of the Punk in Drublic Festival, a beer and punk-music festival presented in partnership with Stone Brewing. Named after NOFX's popular 1994 album, the fest is a daylong celebration of punk, beer, and how well the two go together. This year, the fest's second, the lineup includes performances from fellow punk mainstays Bad Religion, as well as the Interrupters, the Mad Caddies, and the Last Gang. Beer-wise, attendees can expect free samples of more than 100 brews, including Punk in Drublic lager, a collaboration beer between Stone and NOFX. Tickets are currently available, and start at $49.50. Beer tastings are included with every pass, but Very Unimportant Person tickets, which start at $99.50, provide early entry and access to a VUP lounge. Doors open at noon. Currently, the Fat Wreck Chords label founder is hard at work on a full-length album as his alter-ego, Cokie the Clown, and hopes to launch his punk-rock musical, Home Street Home, on Broadway later this year. We caught up with Burkett ahead of NOFX's return to Philly and talked beer, punk, and how exactly he got into drinking. Seeing as NOFX is playing a beer festival, we should start off properly. Do you remember the first time you got drunk? I do. I was 15, it was 1982, I think, and me and my friend Chris were both punk rockers. We were on Balboa Island in Newport Beach and we were walking down the docks. We saw a six-pack of cold Mickey's just sitting there, no s—. So, we grabbed it, went back to the house his dad was renting, and we each drank three Mickey's. We were loaded. It was also the first time I saw David Letterman. It was the episode where Andy Kaufman was on [with Jerry "The King" Lawler]. I was like, "This is a cool show." That's how my life works. I found beer, I saw the best episode of Letterman, and everything's been going good since. Beer played a pretty special role in the NOFX’s first show in 1983, too. Yeah. I beer-bonged a 40-ouncer of Olde English. Not in one sitting. I did it in, like, four pours. That’s still pretty gnarly, number of pours aside. Well, back then, when you're 16 years old, malt liquor is the way to go. It wasn't very good. I've always been a believer in not doing stuff. I have a recording studio, but I have no idea how to use my recording studio. I'll write songs, you learn how to record. I don't want to know how to do all that. You've got to spend your time getting great at a couple things, and the rest of your life, you should be out doing fun stuff. On that note, how did the Punk in Drublic Festival come together? I was approached two years ago by Cameron [Collins from Brew Ha Ha Productions] and John [Reese from Synergy Global Entertainment] and they wanted to put on a beer festival with 21 bands in LA. And they wanted to call it Punk in Drublic. I said no. That sounds like a slog. It was a ton of bands. I'm like, "If you can get me Bad Religion, or something really good, then I'll think about it." I don't want a festival with my name on it to fail. No one over 21 wants to see that many bands. Maybe anybody. [NOFX] and Bad Religion played a show together in San Diego, and that was a beer festival. Instead of having our normal 2,000 people, we had 8,500 people. I went back to John and Cameron and said, "Let's do this, but let's have five bands. Not 21." What has been your job with the festival so far? My job is really to make it fun. Part of that is to have no bad bands. Instead of popular bands, it's about bands that are fun to watch. It's not easy. So bands playing the festival are up to you? How did you pick? I don't listen to kids. I don't go to message boards and see what kids like. It's what I like. Everyone thinks they have a good taste in music. But what's interesting for me is that the best punk songwriters are in the biggest bands — like [Bad Religion guitarist and songwriter] Brett Gurewitz, Tim Armstrong [of Rancid], and me. It's no coincidence that we all own labels, too, because we have an ear that's different from most people's. I don't like music. I like good songs. What can fans expect from an all-day punk-rock and beer festival? When you show up at a hotel [in Hawaii], they give you a lei and drink. At this, you get a drink and you get laid — no, but you're going to be welcomed in. One of the things I'm trying to show here is punk rock is a family. It always has been. People who are older recognize that. I'm trying to bring back that unity-type thing. This isn't a show of emo bands and metal bands and hard-core bands. It's punk-rock bands. As a kid, punk did give me a sense of community I felt was missing. That's how I used to feel about Warped Tour in the '90s. I went on it because there were so many friends' bands that it was like going to a location with all your friends. I loved that sense of community. But as Warped Tour went on, they started getting bands that kids like. The last time we did it, I'm like, "You know, I don't know anybody here except kids. And I don't want to hang out with kids." The thing is, when you don't have kids around, you don't have people all over you freaking out and asking for autographs and pictures. Older punks are cooler. Do you see much of a connection between the craft-beer world and punk rock? Absolutely. That was Cameron. He said, "I want Stone Beer to be partners in this." He got Stone to get behind it because he said they're the best independent craft-beer company. It's all about DIY. Is Philly much of a punk-rock city? Philly, we [last] played in '87 with [influential '80s hard-core band] Fang. I was the bass player because their bass player was getting a tattoo. I never really thought about Philly as a punk town, mostly because not many great bands came out of there. Especially in the old days, I don't even know any. In the old days, it was weird. It was the biggest city that didn't have a big band come from there. After not being in town for so long, is there anything you’re looking forward to? We're playing on [Festival Pier], right? We try to find a nice play to play — just a nice place people can enjoy. We're not selling music or bands. We're selling an experience. We'll play whatever I decide, which is so cool. I get to decide! I get to do that! It's so fun.